Is an artist and academic based in Birmingham, UK, and Cork, Ireland. 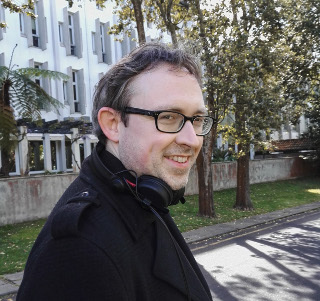 He is an Associate Professor in the Department of Film and Television Studies, University of Warwick, where he teaches on the relationships between cinema, sound and architecture, as well as a practical module on experimental documentary practices that involves a significant focus on field recording. He is a co-investigator on two British Research Council funded projects: The Projection Project, which looks at the role of projection in the history of British cinema exhibition, and Sensing the City, which consists of a series of site-specific studies of urban rhythms, atmospheres, textures, practices and patterns of behaviour in the UK city of Coventry. He is the author of Joseph Cornell Versus Cinema (Bloomsbury, 2013), as well as articles and book chapters on the image of the sleeping body in experimental film, the sonic environment of the projection box, documentary practices, and uses of digital projection outside of the cinema. He is currently working on a book about the sonic environments of cinema and location sound recording. As an artist he works primarily with moving images, sound, and print, and has exhibited work in galleries and film festivals around the UK and internationally. A particular strand of this work addresses the capacity for filmmaking and phonography to investigate and critique urban space and architecture, and the potential for video projection to alter and interact with the space around it. Otherwise, he is interested in: the ecstatic life of buildings; landscape; the material supports of the moving image; the objecthood of the video monitor and the projection screen, VHS tape; the relationship between technology and religion; the potential for technologically augmented spiritual practice; loops; culture, labour and their entanglement with everyday life; the 1980s comic Mister X and the concept of ‚psychetecture‘; slow motion and long duration; ambient video on Youtube; live cinema; the ontology of digital video; appropriation; nonsense.